I have neglected the blog for several years- actually since the excitement of the 50th reunion died down - not adding, revising, or promoting anything other than what folks have sent to me. Looks like I need to do a little housekeeping here soon, both on my own page and on the blog as a whole. For one thing - I need to get some recent pictures of the grandkids posted here. That in itself is all the incentive I need. I'll do a quick fix with some photos of our beautiful Dallas grandkids - Karly (two and a half), and Alex (almost five) and our Waco kids, Tyler (12) and Ryans (8). April 20, 2015 Note: We are expecting grandchild #5 tomorrow. The others grands are now the following: Tyler 16, Ryan 12, Alex 8, and Karly 6. Ed and I both took full retirement in 2013 and we are enjoying leisure days. Our life motto is "Let whatever you do today be enough." My beloved brother - Randy Lofgren - passed away Christmas night, 2014 after a courageous and cheerful 17 year battle with various forms of cancer. We miss him greatly, but are also grateful that he has peace. And here are recent photos of Tyler (age 12) and Ryan (age 8) who live near us in Waco. How blessed we are!!! Now here's my previous biographical information (very out of date). I promise I'll return soon to update it and clean it up. This beautiful baby is Karly Davis, born November 4th, 2008. The significance of her birth for us is that she is the first girl in our immediate family. We have two incredible sons, and 3 marvelous grandsons. We LOVE boys!!! But somewhere in the recesses of our hearts and minds, we did think it would be neat to have a baby girl in that mix. And here she is (below) at one year. She's a sweetheart!!! Karly's big brother Alex is 3.5 years old. He is full of life and so cuddly and loveable. He always makes our hearts sing when we visit them in Dallas. He throws himself into our arms with squeals of delight, and then grabs our hands to take us somewhere in the house or yard where he has predetermined we will play that day. Here are Alex and Karly with parents Megan (a lawyer) and our son Matt (in corporate management with Applebee's Restaurants). They are pictured here at the Dallas Aquarium, along with a couple from the cast of that venue. Below: Tyler and Ryan, ages 11 and 7. They are bright, creative, and athletic. Really!!! You don't think I'd exaggerate about my own grandsons, do you? They live just a few minutes from us. We feel so blessed to get to see them - and their parents - regularly. And we love being able to attend so many of their school, church, and sports activities. Here are Ryan and Tyler with their parents, our son Jonathan and his wife Jennifer. Jonathan is a senior engineer with L-3 Communications working in their Airborne Division as well as coach for many of the grandsons' athletic teams. Jennifer is a 2nd grade teacher and Super Mom. These days our lives seem to revolve around these eight “kids”, celebrating special occasions, recreating with them, attending Baylor sports activities with them, and following the two older grandsons’ sports team events. After graduating from Milby, I attended Baylor University, pursuing a degree in Elementary Education. Early on, I met Ed Davis (a Clear Creek Wildcat) and we married when he graduated at the end of my second year. We moved to Denver/Boulder, Colorado, and I completed my degree work at the University of Colorado. Since that time we have lived many places far and wide - Colorado, Benghazi Libya (North Africa), Houston, Indiana, Wyoming, and back to Texas - in that order. Ed and I both work in the field of education, and he has a very adventuresome spirit, somehow thinking that moving to a place and working there is far better than just going there on vacation. Now we are back in Waco, having lived here for 21 years, the longest we have lived anywhere. Ed has been a professional educator for 48 years (the same number as the years of our happy marriage!). He was an administrator for 28 of those years – teacher, counselor, principal, personnel director, superintendent, headmaster - but now he is in “semi-retirement”, back in the classroom as a high school math teacher and math department chair. My career in education has been somewhat the reverse of Ed’s. After teaching for 7 years, we were finally blessed with children and I took the next 18 years off to be a stay-at-home mom and fulltime volunteer. 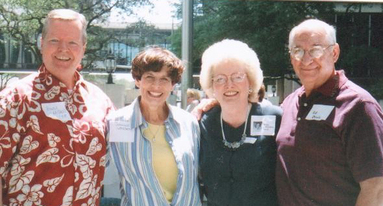 I re-entered the teaching profession at age 48, when we moved to Waco for Ed to work on a doctorate at Baylor. I have served in an administrative role (Instructional Facilitator) in a Primary School setting for the last 14 years. One of the highlights of my professional career is being named the 1994 Texas Elementary Teacher of the Year, an honor of which I am very proud and for which I am very grateful. Our many moves have afforded us great opportunities to travel. The summer before, between, and after our 2 year tenure in Benghazi, we traveled extensively in Egypt, Greece, Kenya and Tanzania, the Middle East (including the Holy Land), and all over Europe. Click here to view photos of our adventures while living in Africa. All of that was before we had kids. While they were growing up we had a small motor home and crisscrossed our country numerous times – as we moved, as we made visits home, and as we vacationed. Our family was very much into skiing (the fast, downhill kind for the guys; the slower, cross country style for me! Ed joined me moving at a much slower rate of speed from time to time.) Many of our Winter/Spring Break trips involved ski opportunity destinations. Are you familiar with Bible Study Fellowship? I was affiliated with that wonderful inter-denominational organization for 20+ years, mostly during the years when I was not teaching school. After being in various leadership positions in BSF classes in Houston and Indiana, I was lead and enabled to start a class in Wyoming, and served there as the teacher for 6 years before moving to Waco. (The Wyoming class has continued under "new leadership" for the 20 years since we moved away, and they still have 200+ class members per year.) That entire Bible study experience was probably the most defining one of my life. Alas, we have no prospect of retirement. Our many moves from state to state and overseas were wise decisions in terms of life experiences, but not so wise in terms of building up a retirement plan. Looks like we will be teaching well into our 70’s – if our mental and physical health allows it. Ed had a triple bypass a couple of years ago, but blessedly, it was to prevent a heart attack rather than as a result of one. I am generally in good health, although I have the usual aches and pains that seem inevitable for “people our age”. My main hobby is creating memorable layouts in my many memory albums. (“Lord, when my memory goes, please help me find my scrapbooks!”) For a glimpse of the creative projects that are significant in my life, click here. One other significant thing in our lives at this time is our close association with my brother Randy and his wife Jeanine. Randy got his doctorate at Baylor and is now an Associate Vice President at Baylor. Randy and Jeanine are our very best friends and we are so happy to live close to one another. Our combined families (kids, grandkids, nieces and nephews and their children) are a wonderful support group and give us great pleasure as we approach our golden years. We are blessed indeed!!! And that's the end of my Biography...whatever else follows is just something I thought was fun and wanted to share with you. Here's an image discovered in my folks' box of photos when I was closing down their home. 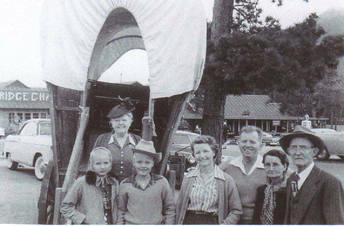 The lady with the hat is my paternal grandmother (we called her Wa-Waa of all things - Randy started it!). She lived in Illinois. The gentleman with the hat and the little lady attached to him are my maternal grandparents, who lived in Moscow, Texas. The younger adults are my parents, and you can surely recognize Randy and me. Here's the unbelievable part. In 1953, these 7 people piled into a Nash Rambler and traveled from Houston to Yellowstone and back (touring Rocky Mountain National Park enroute) in the middle of the summer - no air conditioning then. It was certainly a bonding experience!!! (But why the hats? My g'pa (George Ridley Dudley - see photos below) was a poor dirt farmer - why did he think he had to wear a three piece business suit on such a trip?) But all I can remember is that it really was a lot of fun!!! Here are some vintage photos of my grandfather's family - the story of my great-grandparents during Civil War times follows. This is from a comment I made on the "SPEAKING OF BOOKS" post by Glenda Burns Minniece... when a number of us got off on a tangent of talking about our ancestors and the Civil War. Lula Brantley Dudley and William Hardy Dudley had 6 sons and two daughters. The boys (and an assortment of friends and relatives) built a beautiful home for their mother in Moscow, Texas (between present day Corrigan and Livingston). My grandfather, George Ridley Dudley, is second from right, standing. Here is a photo (below) of some of the Dudley clan that settled in Texas after the Civil War, circa 1900. My grandfather is in the middle of the back row. His mother and father (the subjects of the comments below) are the couple on the far left of the middle row in the photo. The other older gentleman is William Hardy Dudley's brother. Here is a comical photo of my mother and father on their honeymoon trip when they stopped in Moscow to visit her grandmother (Lula Brantley Dudley). There was no trick photography or photoshopping this picture - just a prank my father learned from his fraternity brothers in college. Here is Lula Brantley Dudley shortly before she died at age 91 in 1942. I am glad to know that she at least heard of my birth (in Chicago) before her death. Wouldn't this strong-willed, gutsy old woman marvel at the 2008 technology that allows her photo to circulate in cyberspace? I am sure she would be right in there learning how to use it! Karla's comment under "SPEAKING OF BOOKS...", submitted 08/10/08: These are interesting comments regarding the Civil War era. Reminds me of some of my own family history, and I recently learned some new details from a book I have been reading. In her later years (when her memory was not very reliable and her “stories” were often a reflection of something she had seen on TV) Mother repeatedly told the story of her paternal grandmother who fled to Texas with mother’s grandfather, and that against her fathers wishes. In the same story she also mentioned Sherman’s March to the Sea, soldier’s billeted in her great-grandparents’ home, and the slave girls dancing in the mistresses’ dresses when they were allowed by the soldiers to enter what was evidently a grand plantation home. (I pictured ‘Tara’ in “Gone With the Wind” when she described the home.) I had not heard Mother speak of these things previous to her later years, and I was never quite sure if any of this was true, but I did think it made for interesting family history. The book that I have been reading which sheds some light on these uncertain memories of my mother’s is entitled “Memories and Meanderings” and was written by my mother’s much younger cousin, Carroll Fancher. Some of you may remember him as he was a Methodist minister in the Glenbrook Valley area around the time we were in high school. The book is a beautiful daily devotional book which takes the reader through the Bible in one year. It incorporates his own personal musings as he reads that day’s scripture, and it is somewhat autobiographical in that he weaves family history throughout. I am enjoying reading it immensely. “My grandmother told a story that I loved. I asked her to tell it over and over again. She was Lula Brantley, the daughter of William Brantley, a plantation owner in Georgia at the time of the Civil War. Grandma was about eight when the family had to abandon their home and go to the swamp and hide from General Sherman as he marched across Georgia. The part of the story that intrigued me most was the trip home in the wagon. As they emerged from their hiding place and started home, they discovered the devastation of each home they passed. But when they came to their home, it was still standing. The slaves told them that the Union army had camped at their place and one night a party had been held by the slaves. It seems that General Sherman went through Great-Grandpa Brantley’s papers and discovered that they were Masonic brothers, and so their home was left intact. I am enjoying this book for many reasons, but especially for the insights that it gives me into family history. Please take the time now to make a comment in response to Karla's biography. You will also enjoy reading the comments that others have left. What a wonderful family and extended family you have. I enjoyed reading your bio so much. I remember meeting your grandmother from Illinois when she visited Houston one time. Also, I thought I was looking at your mother in the picture of your family reunion, 2008. She and her sister looked just alike. I am looking forward to visiting with you and Ed at our 50th. Thank you for all of the time and effort you put into making this blog possible. Hi, Karla. I just finished re-reading your bio and enjoyed it too. Especially enjoyed seeing your family and all your craft works - wow! - you have beautiful kids/grandkids and are really talented! Ken and I are looking forward to seeing you at the reunion. Carole (Mrs Ken) Corey.